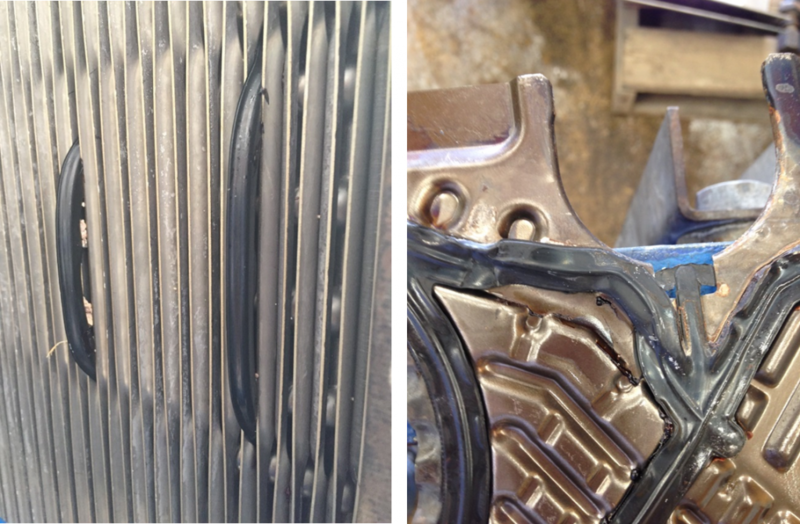 Some Reasons Why Do Your Gaskets Fail | Plate Heat Exchanger WA Why Do Your Gaskets Fail? Selecting the correct gasket material is vital to the effective operation of the plate heat exchanger. The majority of PHE gaskets are manufactured from rubber polymers, requiring replacement when the gasket loses its ability to seal due to hardening, loss of compression set and deterioration. With time, all rubber gaskets will eventually degrade, losing their properties and rendering them unsuitable for further use. 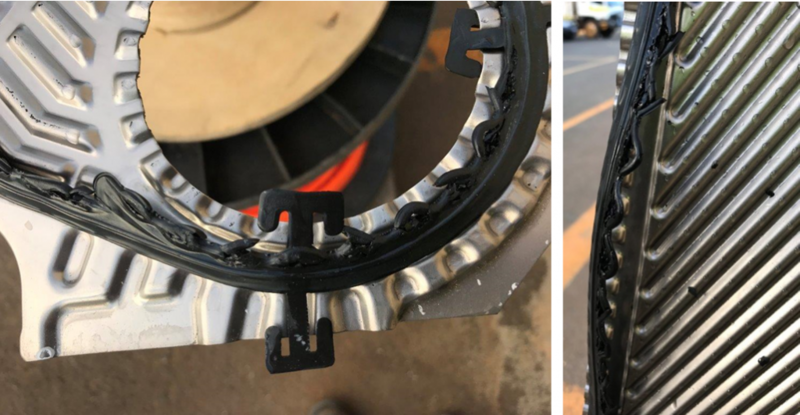 Overtime the gasket undergoes an oxidation process due to exposure to the surroundings (external and internal) typically making the rubber gasket harder, eventually leading to cracking and leakage. The rate at which this occurs further increased if the PHE is outdoors and the gaskets are being exposed to UV light. The lifetime of the rubber gaskets is dependent upon the original quality, the environment, the temperature and the operating fluids the gasket is exposed to. Additionally, fluctuations in pressure and temperature can significantly affect the performance and lifetime of the gasket. 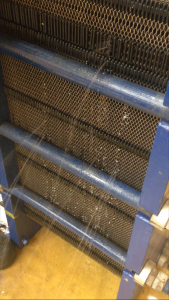 For example, a large spike in pressure within the heat exchanger due to an external problem can ‘push’ or force the gasket from its groove within the plate and cause leakage. All rubber gaskets have a maximum temperature that should not be exceeded in order to avoid deterioration or catastrophic failure of the gasket, reducing the sealing capability and performance. If the operating fluid temperature is close to or above the maximum gasket temperature for an extended period of time then the gaskets can melt or over-cure. This results in a flattening of the gasket, reducing the integrity of the seal making it prone to failure. Each rubber polymer that gaskets are manufactured from has its own resistance to various chemicals. In order to maximise gasket lifetime, prevent process contamination and avoid failure it is important to ensure the correct gasket material is selected. As can be seen from Table 1, NBR is typically suitable for oil/ fat applications, whereas, EPDM is applied in caustic or acidic applications. An example of where the wrong rubber gasket type was selected can be seen below, where the rubber has reacted with the chemical flowing through the PHE. Knowing the right time interval to replace gaskets for critical plate heat exchangers ensures the reliability, output and production time of the process plant. Gaskets will lose elasticity and sealing capabilities at a rate dependent upon the operating conditions. For example, applications involving water at low temperatures can have a service life of many years before the gasket polymer begins significantly degrading, however, the build-up of scale over this time period can lead to increased energy consumption costs. Comparatively, gaskets in high temperature caustic or acidic applications will be subjected to greater stress and degrade at a quicker rate, needing replacement after a shorter time interval. 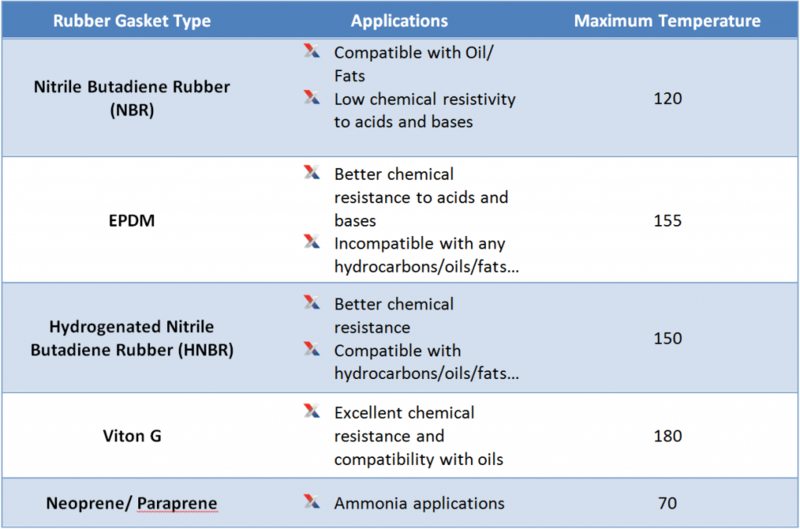 It is crucial to understand the capabilities and limits of the gasket rubber compounds. New PHE gaskets are highly resilient, compressing to seal in the fluid and by maintaining this condition we can ensure peak performance and prevent failure.